Promotional products from Heritage Advertising have the best prices to allow you to promote your products at the lowest prices. The Child Identification Program is a community service initiative dedicated to changing these statistics by providing parents and guardians with a tool they can use to help protect their children. The I.D. Kit allows parents to collect specific information by easily recording the physical characteristics and fingerprints of their children on identification cards that are then kept at home by the parent or guardian. If ever needed, this I.D. Kit will give authorities vital information to assist their efforts to locate a missing child. Custom emery board advertising printed on white (natural) emory boards. One of the cheapest ways to advertise your business! Emery file boards are a great promotional product. Buy Frisbees with your custom message. Wholesale Frisbes at low prices. Buy these with your custom message. These frisbees are a great gift for Vacation Bible School! They are also great at company picnics for reinforcing paper plates and giving to employees to take home. Note our Special Low Prices. Promotional Frisbees at low prices. Buy these with your custom printed Logo or message. 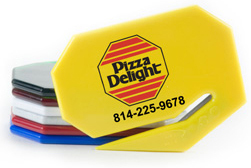 These custom imprinted letter openers are long lasting and leave a positive impression every time they are used. Very useful and appreciated promotional gift item. Many styles and colors are available. 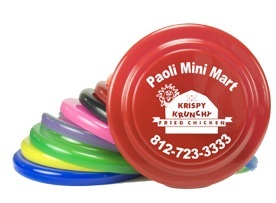 Have your company name imprinted on a gift yo yo. Yo Yo Printing is personalized advertising. Jar Opener with your promotional printed logo are custom imprinted with your name. Cheap prices on the Internet for cheap promotion jar openers.